How Do We Create Fear & Anxiety? 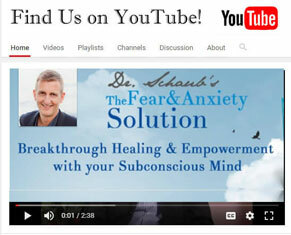 Watch the video message above from Dr. Friedemann Schaub, author of The Fear & Anxiety Solution. Dr. Schaub has helped thousands of people all over the world overcome fear and anxiety and build a strong foundation of confidence and self-empowerment. Most clients need only 6 to 8 sessions with Dr. Schaub to become free of fear and anxiety! You have probably noticed that you can't use logic or reasoning to talk yourself out of being anxious and insecure. The reason is, that fear and anxiety aren't created by the rational conscious mind, but originate in the deeper subconscious mind. Dr. Schaub's Breakthrough Program helps you to access your subconscious mind and to discover and address the subconscious root causes of your fear and anxiety. How would it feel to you, if you could let go of your emotional baggage and start fresh with a clean slate? With Dr. Schaub's Breakthrough Program you will be able unload decades of emotional baggage and find peace and resolution with the past. One of the major root causes of fear and anxiety are inner conflicts, where a part of you wants to move forward and have a more enjoyable life, while another part of you seems to holds you back through negative self-talk, procrastination and self-sabotaging behaviors. With the Breakthrough Program you will learn how to end your internal struggles and thus achieve mental and emotional clarity and congruency. Limiting beliefs such as "I am not good enough" or "I am not safe" define how you see yourself and the world around. In order to help you overcome fear and anxiety once and for all, Dr. Schaub's Breakthrough Program helps you to replace your old anxiety-driven identity with a new foundation of confidence and self-empowerment. In addition to that you will receive ongoing e-mail support, breakthrough tools and homework to solidify your results and a complimentary recording of each session. Please enter your contact information and Dr. Schaub will review your Survey and email you an invitation for a Complimentary Consultation.